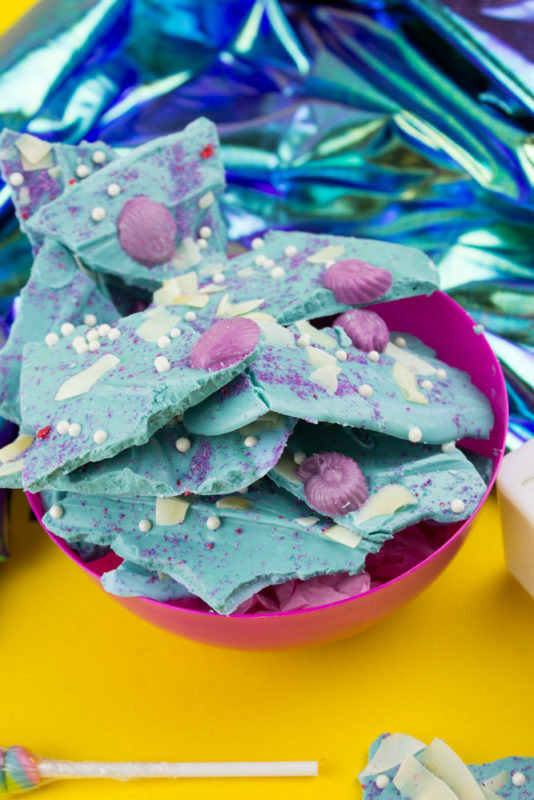 Dive under the sea with some Magical Mermaid Bark! 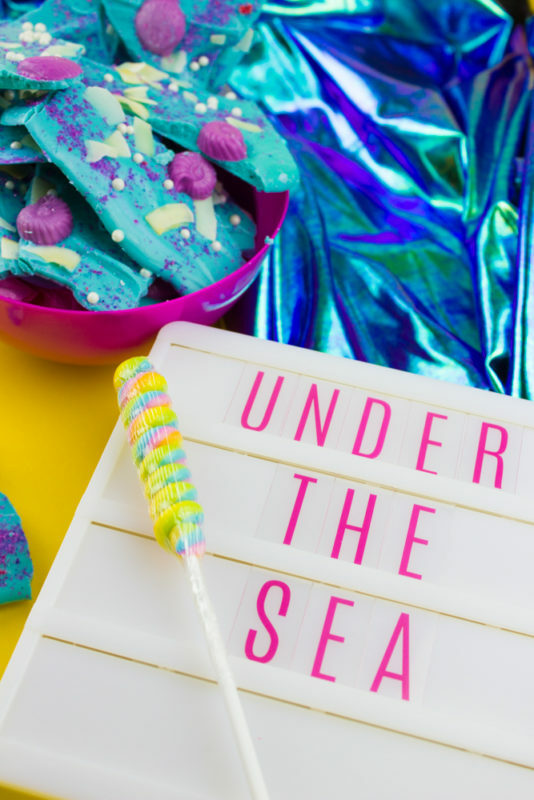 Inspired by your favorite mermaid, this sweet treat is a must have for your summer parties or treat table! In case you didn’t hear there is apparently a mermaid trend this summer. Does it look like I’m caring about that?? Okay maybe a little. But seriously folks, I was watching The Little Mermaid with a friend (because that is what we do okay?) and we were both feeling the need for some sugar and well, this happened. 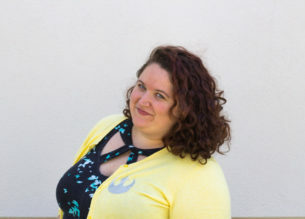 I feel no shame or guilt about any of it. None at all. So yeah, be a mermaid, get that swimsuit. Eat some chocolate and just embrace that -ish okay? Okay! Magic level: Titus Burgess as Sebastian magical. 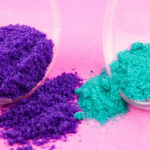 Sanding Sugars in purple and blue. – Learn how to make your own here! If you’re up to making your own sanding sugars go ahead and make those first. 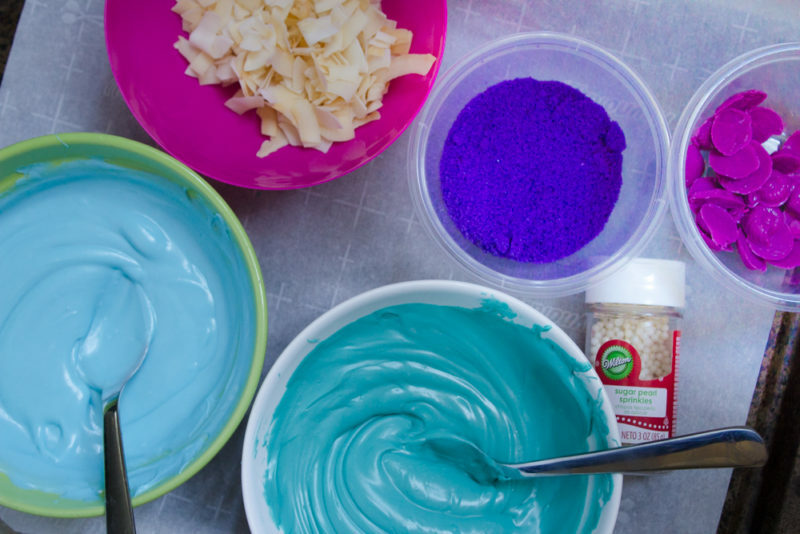 Make your purple seashells! 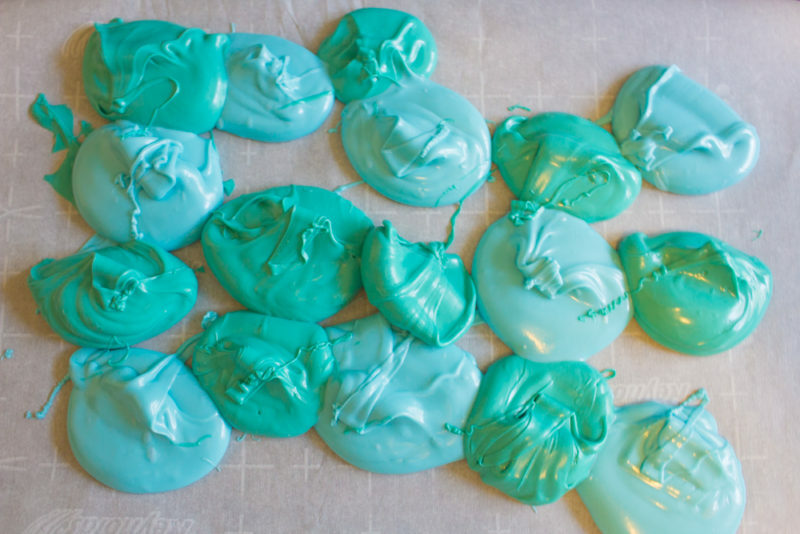 Place 1/4 cup lavender candy melts into a piping bag. Twist the top closed and microwave for 30 seconds. Pull it out and squish around. Microwave again in 15 second bursts, mixing and squishing in between until it’s all melted. Cut a hole in the tip of the bag and fill each cavity in the mold. You may not fill all of them, but fill as many as you can. If you have any overage, simply use the edge of a spatula to smooth out. Place in fridge or freezer for 10 minutes. In separate ceramic bowls, melt your candy melts. Microwave for 1 minute. Stir. Return to microwave and zap in 15 second bursts, stiring in between until fully melted. Do this for each color you’ll be using. Line a baking sheet with parchment paper and place dolops of each color next to each other on the parchment paper. This is where I like to get my agression out and sometimes act like Jackson Pollock. Just go with it. 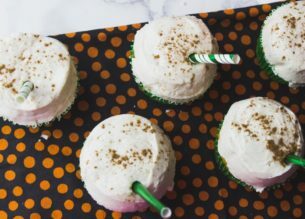 Next, use a butter knife or spatula to smooth out and swirl the colors until you’re happy with the design. 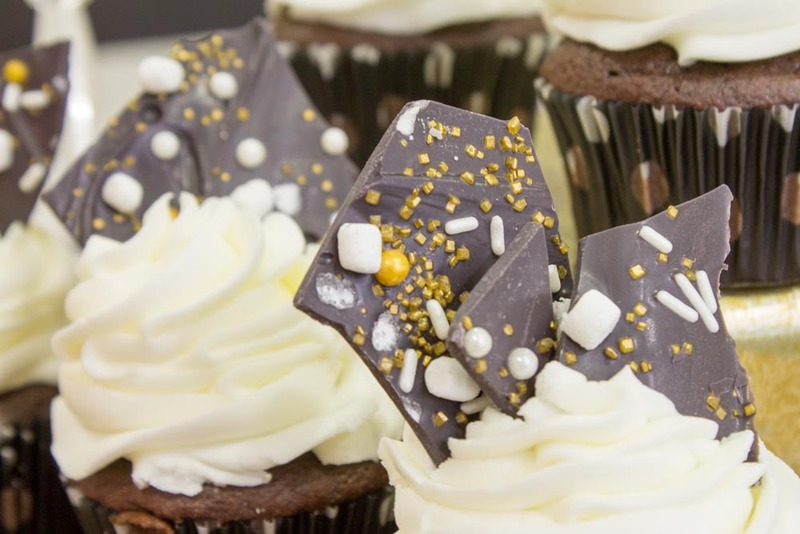 While the chocolate is still kinda melty, spread your place the seashells on the base bark and sprinkle with the coconut bark, sanding sugars, and sugar pearls. Place in the freezer for 10 minutes or in the refrigerator for 30 minutes until the chocolate is set. 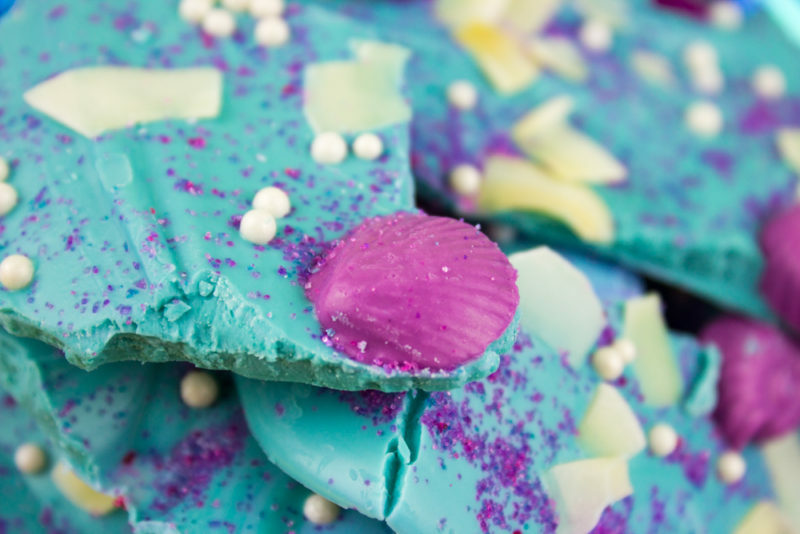 Break it up while jamming to your favorite version of Under The Sea and eat your mermaid bark with your equally mermaid obsessed best buds! 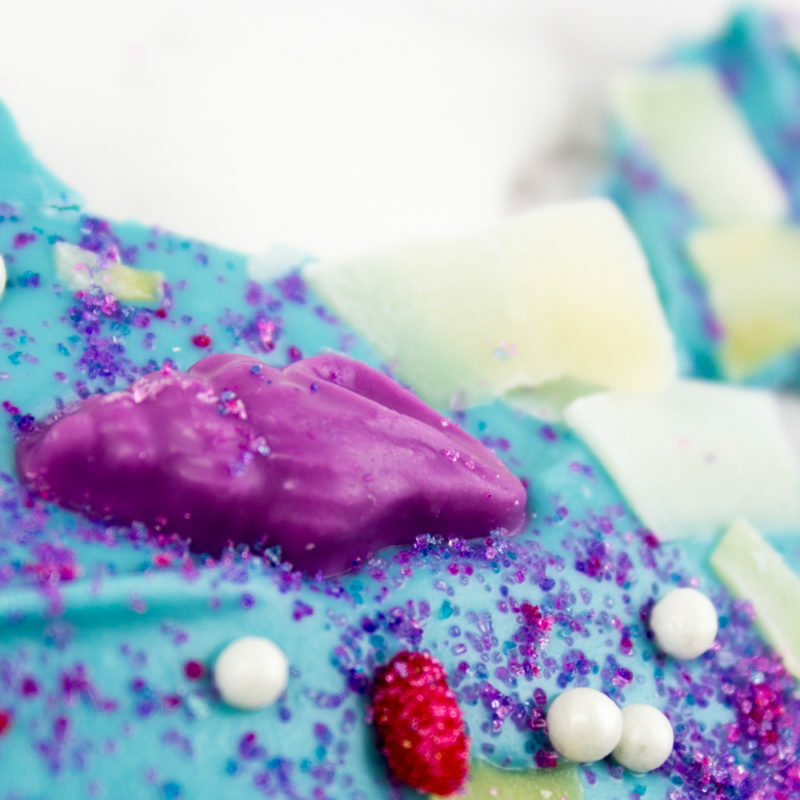 Don’t forget to PIN this post if you’re as obsessed with all things mermaid and magic!